Whether the arsenic comes from a public source or a private source, it can and will cause illness and sometimes death in high enough concentrations. Since arsenic has no color, taste or odor when dissolved in water, often times a private well owner will not know they have an issue with arsenic contamination. Should You Test Your Well for Arsenic? How Can I Get My Well Tested for Arsenic? Contact someone in your local health department or look in the yellow pages for an environmental testing laboratory. Make sure to ask if the facility you contact has the proper certifications to do drinking water testing. Call the Safe Drinking Water Hotline at 800-426-4791 and ask for a state certification officer that can provide the names of certified facilities in your area. 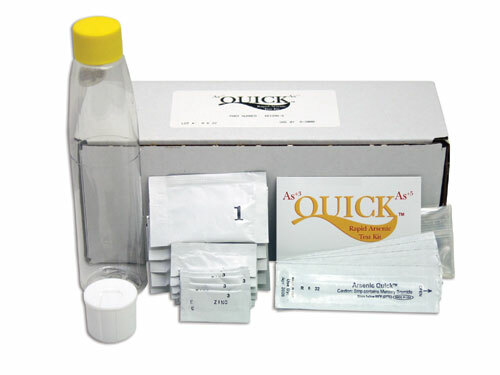 If you wish to do the field testing yourself, take a look at the easy-to-use, field-ready Arsenic Quick Test Kits. … falls squarely on the shoulders of individual well owners. No local, state or other branch of government will force a private well owner to test their water and/or fix any problems that may exist. We believe that if a thing is worth doing, it is worth doing correctly. Therefore, before you spend money on a water filter for arsenic, make certain you do not have other unwanted drinking water contaminants, as well. For testing of that nature we suggest contacting an independent (and accredited) water testing lab in your area and/or using a test kit such as the WaterCheck Laboratory Test Kit for Drinking Water which test for 97 different water quality parameters: Bacteria (presence/absence for coliform and E.coli), (19) heavy metals and minerals, (6) other inorganic chemicals, (5) physical characteristics, (4) trihalomethanes, (47) volatile organic chemicals (VOCs), and (20) pesticides, herbicides and PCB’s. « What is Arsenic and Can It Harm You?